Perfectly happy, no complaints and as always, you gave excellent service. Ever tried sharing music using a 3.5mm splitter only to discover your listening partner can't stand how loud you set the volume? Well, that's a thing of the past now, with our handy 15cm 3.5mm splitter cable with independent volume control dials! 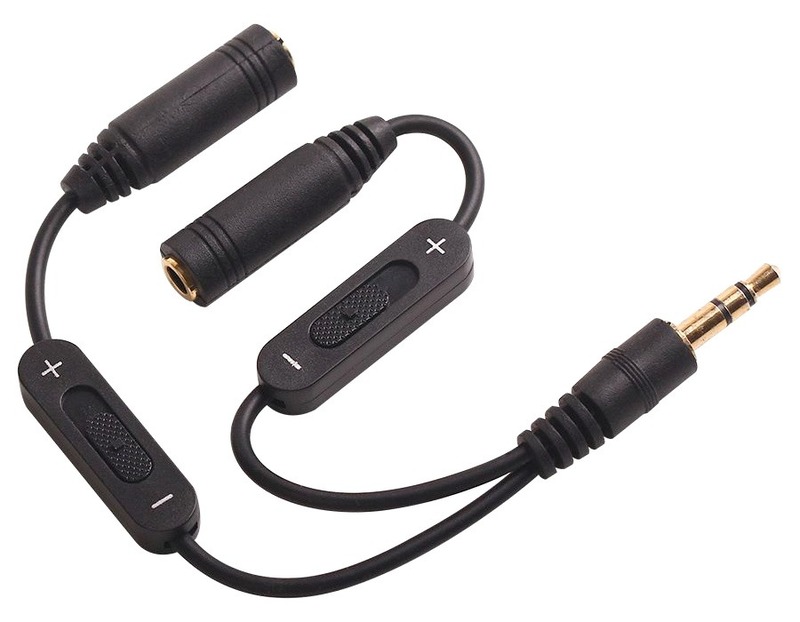 This passive Audio Splitter cable lets you share a 3.5mm audio source with two speakers / headphones, while individually controling the volume for each device! Each side of the splitter includes a tiny potentiometer which limits the current (and therefore volume) after the sound had already left your stereo or MP3 player. It is designed for use with headphones, but can just as easily work with other speaker system by using RCA or 6.5mm jack adapters (sold separately). Note: To save on space and costs, this splitter combines stereo channels. This means you'll hear both the left and the right side of the stereo signal in each ear. This isn't a problem for regular music listening, but it will be bothersome in a recording studio or for positional audio in games. But hey, at this amazing price, a little stereo mixing is no big deal! Note: Daisy-chaining these splitters is supported but not recommended in most situations as you will lose volume and signal strength each time the power is divided. Amplifiers or amplified speakers will be required to achieve full volume after multiple splits. Answer: "I believe this is the correct adapter for you: http://www.cablechick.com.au/cables/premium-4-pole-trrs-to-35mm-stereo-mic-splitter-cable-male-to-2x-female.html"
Thanks for the excellent service & value � it was a matter of sticking with component or going with HDMI.